I am viewing it now and bursting with gratitude. This is an important work!" Her poetry drew laughter and tears from me. I learned many facts to apply to myself and to my writing. Most of what I learned is her enthusiasm for the craft of writing. Her poem "Mastectomy" (from her book Mercurochrome) helped me to understand more about the physical and emotional nature of the removal of women's breasts and I was in tears by the end of her reading. 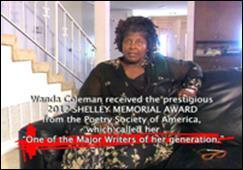 her poetry, and Wanda herself. What drew me to listen with different ears when she read her poems was the emotion she poured into it. She didn't just read it; she didn't perform it - she was the poem come alive. I would love to watch this interview again to pick up anything I missed, since it was filled with so much amazing information. GV21 is not just an interview - it is a lesson in life, love, the craft of writing, and one writer's way of surviving and overcoming what life handed her. 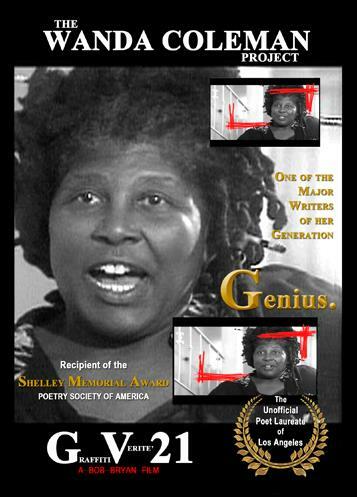 This documentary should be required viewing in every creative writing classroom for young and emerging poets who think they want to write poetry or anything else. have been blessed and skilled to have as a talent. interview. 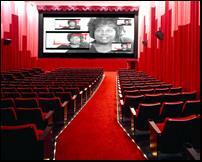 You made it extra interesting with the sound & special effects. 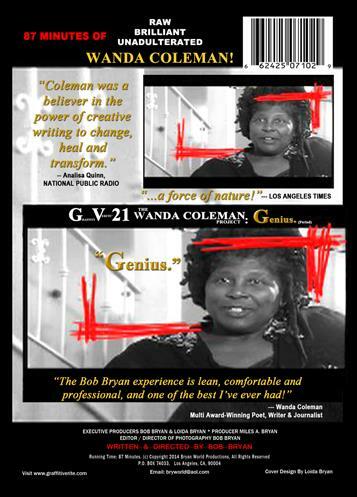 “Normally, I am not one to watch or listen to interviews, but GV21 THE WANDA COLEMAN PROJECT: Genius. had me riveted to my seat in front of my computer. I could not tear myself away from Bob Bryan's unique questions or Wanda Coleman's inspiring answers. To describe Wanda Coleman - she was vivacious, beautiful, self-assured - without being vain, and a champion to people who needed one. And not just black women, but to people of all races and both genders. I learned from her and learned about myself through her. 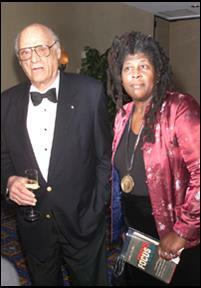 Bob Bryan's interview with Wanda Coleman is a classic example of a sensitive, intelligent, and superbly prepared Documentarian eliciting brilliant responses from a genius poet/writer/journalist who is forced by smart questions to think deeply, eloquently and movingly. Many moments in this film made me laugh or cry or just sit there in wonder at the depth and breadth of this woman's mind. And I was her mate for nearly 33 years! This film is far and away the best of all the dozens of interviews Wanda ever did and I am profoundly grateful to Bob Bryan for giving me this treasure I can turn to whenever I feel like being reminded of my beloved's fantastic mind.